Do you find the poem, or does the poem find you? Call 612 223-POEM. Brian Beatty’s poem is short and lovely, and takes place at the old Ford Motor Plant that they’re tearing down starting Monday, June 10. 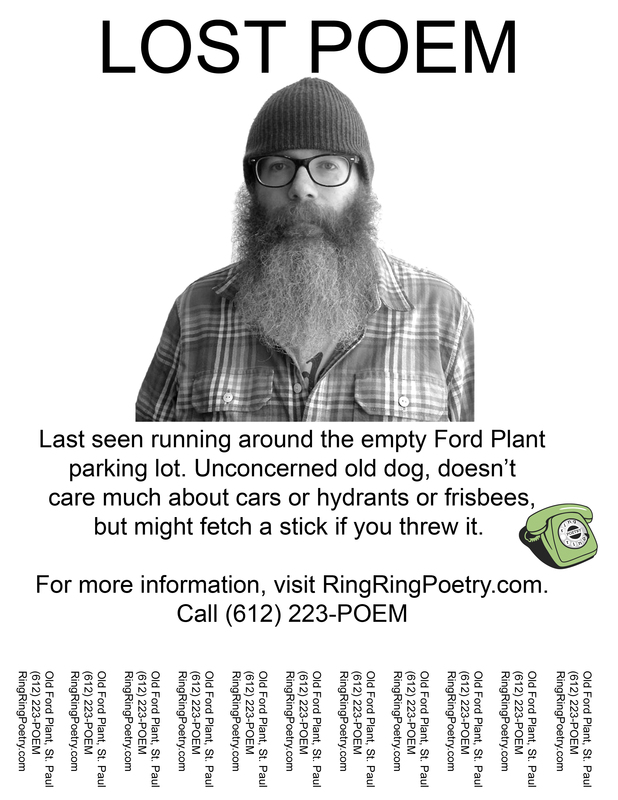 It’s worth trying to go and listen to Brian’s poem wherever you can get near the old Ford Plant while they’re tearing down the plant, because this is a lot of what his beautiful little peace is about: that which is temporary, and will be reclaimed. Brian Beatty’s jokes, poems and short stories have appeared in numerous print and online publications. His limited edition humor chapbook DUCK! was published in 2009. He has a poetry chapbook, Earliest Bird Calls, due out from Ravenna Press sometime in 2013. Brian hosts the monthly literary podcast “You Are Hear” and writes the “The Columnest” twice each month for mnartists.org. Happy to be included in this project. And as the son of a Chevy salesman, not entirely unhappy about the Ford plant’s fate. What IS Ring Ring Poetry? Ring Ring Poetry is a poetry installation featuring Minnesotan poets, "broadcasting" poems written for specific locations in the state. Audiences are encouraged to go to those locations, call the Ring Ring Poetry phone number, and experience poems there within the poem's location. Ring Ring Poetry was created and is executed by Cole Sarar. The 2014 Ring Ring Poetry Season will debut poems weekly June-August throughout Minnesota, through a generous Emerging Writers Grant hosted by The Loft and funded by the Jerome Foundation. The 2013 Ring Ring Poetry Season was funded through a VERVE spoken word grant, hosted by Intermedia Arts. In 2013, Ring Ring Poetry debuted new poems in the Twin Cities from May 2- June 28.